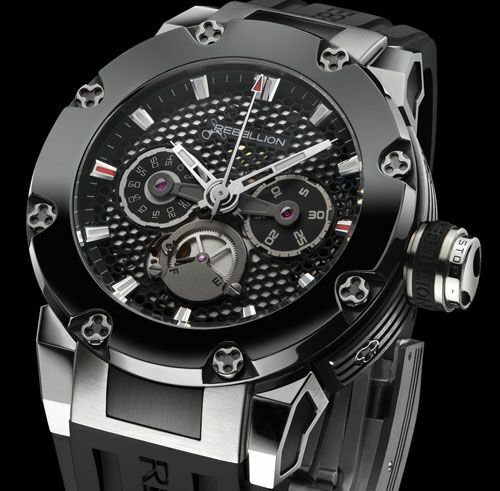 Rebellion, Masters of The Power Reserve, will be revealing their Predator Chrono Mono-Pusher during this coming BaselWorld show. Last year, they introduced the Predator Chrono with the regular start, stop and reset buttons. This year, they are going Mono-Pusher. This means that there is only one button – on top of the crown – for starting, stopping and resetting the chronograph mechanism. Will this Predator Chrono Mono-Pusher be a true competitor for Hublot’s Big Bang, AP’s RO OffShore or the LW SpidoSpeed Chrono? All these watches are crafted from high-tech materials and have a strong relationship to the racing world. Click here for my article on this pre-Basel release by Rebellion!